Welcome and thank you for supporting the Red Poppy 5K that will start at 9am at Georgetown High School Annex (actually on the back side of the Annex). The majority of proceeds will be given to Williamson County Children’s Advocacy Center. The center provides a safe place to disclose child abuse, reduce the emotional trauma for children and their non-offending family members, and extend professional services that protect the integrity of an investigation. To learn more visit www.WilcoCAC.org. A portion of the proceeds will go to the Lighting of the Square activities in downtown Georgetown during the holidays. 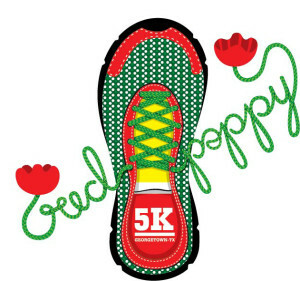 Important Note: If you are running the 5k AND riding the Red Poppy Bike Ride then you must register for both AND you need to start a distance under 50 miles no later than 10am. With this in mind then you probably need to be able to finish the 5k in 40 minutes and can quickly transition to your bike. This offer was given by the organizers of the Red Poppy Bike Ride. We think this is fantastic and appreciate your cooperation in complying. Guaranteed shirt for entries received by 4/16. Those that registered after 4/16 while supplies last. This allows for more money to the charities and not into leftover shirts. If you didn’t get a shirt, check back after you finish the Red Poppy 5k, any shirts not claimed will be given to those that didn’t receive a shirt. We will not be holding shirts after race day pick-up. Thank you for your understanding. The Red Poppy 5k participants will park at Georgetown High School (newer looking building with the band semi-trailer in the parking lot). The Red Poppy Bike Ride parking is at the Georgetown High School Annex. Stadium Drive will close between Austin Ave and Inner Loop at 7:30am. Race bibs are donated by Road ID and should be worn on the front of every participant. It is crucial for timing and therefore, distributing awards. The Red Poppy 5k Course Map is primarily on the Georgetown High School grounds but will include an out and back on Stadium Drive. There will be a water stop that you will pass twice. Make sure you bib is visible on the FRONT of your shirt. Also, please don’t cross the finish line more than once. Follow the arrows on the right side of the road to the finish. Presented to overall male and female finishers, overall masters male and female finishers, and the top three male and female finishers in the following age groups, 10 & under, 11-19, 20-29, 30-39, 40-49, 50-59, 60 and older. Posted at NoExcusesRunning.com & GeorgetownRunningClub.org on 4/29. There will be a Kids’ Fun Run that will be held after the final finisher. We are planning on going up to the track to have them run. The fun run is free but we suggest a $5 donation. All kid finishers will receive a ribbon. We would like to thank AdvoCare, Camp Gladiator, and Pinot’s Palette of Georgetown.